John Searancke was, until recently, restaurant reviewer for the Tenerife newspaper Island Connections. 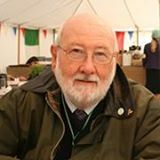 Born in 1943 at Derby Royal Infirmary, a war baby, he lived his early life in Ashby-de la-Zouch and was sent away to be educated at Kings Mead Preparatory School, Seaford and afterwards at Rugby School. Later commissioned into the Territorial Army, he has been variously a director of a light engineering company, an hotel and restaurant owner, director and chairman of a marketing consortium, and latterly a partner with his wife in a commercial legal services company. He has enjoyed working in England and Switzerland and has homes in England and northern Tenerife, where he now lives with his wife Sally. All of my 3 books, in one way or another, inform about family life. I wanted to share this with my family before it is too late. I write as the mood comes to me and bash it out on an ancient laptop. I have a very freestyle way of putting it all together. My long suffering Editor then knocks it in to commercial shape. I would not presume to offer advice to other writers. There are so many people out there more qualified than I.
I was offered a contract with a traditional publisher but my cut was ridiculously small so I went to Troubador to self-publish. Books are making a comeback, are they not?